Photographer Alex Crawford was born in Sugar Land, Texas. As many Texans will tell you, spending a lot of time outdoors is a natural part of growing up and it was no different for Alex. He loved to fish and hunt and whenever possible, ride his mom's horse. At the age of 14, Alex's parents bought some land in Paige, Texas just outside of Austin. 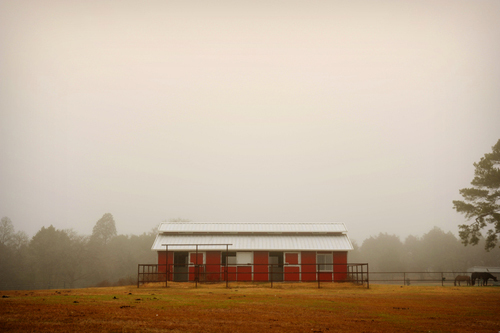 The above picture was taken on that land- his parents' horse barn on a foggy morning. When I see a pecan sign, I know I'm in the South. Alex explains, "This is a sign on Highway 71 from Paige to Bastrop, Texas. I had to stop and photograph it as it has become a landmark on my drive. And, who doesn't love fresh roasted pecans or pecan pie?" The sweet photograph to the right is of Dovey and Ellie, two of his mom's horses. Both of these photos were taken in Smithville, Texas. The building on the left oozes rural charm- layered and weathered with age yet modernized with that blue awning and red door. I wonder what's inside? As an artist, Alex was immediately drawn to the character and soul of Smithville, explaining "It's one of those fantastic little towns that seems to have survived the last sixty or so years without being touched by time." It's been tough to watch footage of the raging wildfires just outside Austin this week. Alex's photograph clearly documents the severe record breaking drought, with many of the creek beds drying up throughout the state. Since January 1 of this year, 1.4 million acres throughout Texas have burned. Texas is space. There is a vastness and openness to the land and sky that connects one quickly and intimately to its strength and vitality. Alex's image above, taken on a clear night, captures the wild and beautiful spirit of rural life that has become a constant in his life, serving an important role in his growth. Alex adds, "My visits there allow me time and space for introspection." The theme of his images are not the specific towns or subjects captured but as he explains, "my emotional response to the world outside the safety of the ranch." To see more of Alex's work, click here or follow Alex's more fashionable side on thestyleblogger.com. Alex captured these images on a Yashicamat 12G TLR camera utilizing Fujichrome Velvia 100 film as well as a Nikon D700 digital SLR.